The Big Carrot is excited to invite you to participate in a community-engaged permanent public art piece. 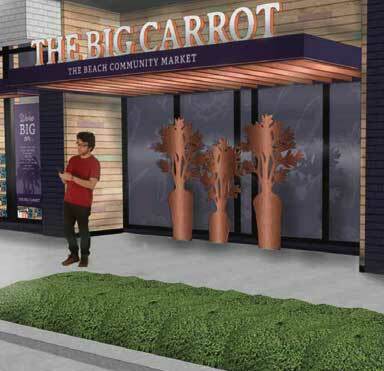 The Big Carrot is looking for local artists to create an outdoor sculpture (or set of) to be erected at street level at the new The Big Carrot – The Beach Community Market on Southwood Drive. 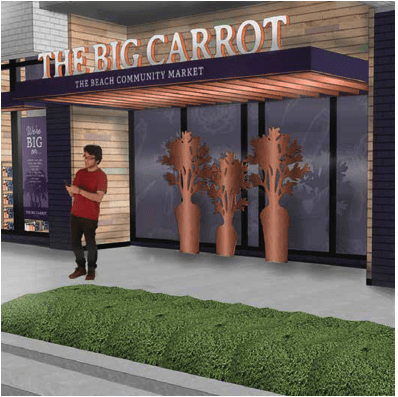 To create a monument to The Big Carrot history and a marker for the future, that creates a connection to the community and a potential ‘selfie moment’ location. The Big Carrot is the neighbourhood destination that is founded in the spirit of inclusivity. We offer personalized, informed service and a passion for health and wellness. In addition, we are a sustainable and responsible retailer, we are worker-owned, and operate a democratic workplace. We want everyone to share in the goodness we offer. Quirky. Genuine. Approachable. Straight-forward. Passionate. What are the Execution Considerations? Must haves; connection to carrots (originally envisioned as three carrots partially rooted), incorporate (or preferably use exclusively) copper material, incorporate plaque(s) with The Big Carrot story (referenced below). Consider safety as a key concern as this is a public space. This design brief is meant to be directional and not prescriptive. Artistic expression is paramount in delivering a genuine art piece that the store and the community can observe with both pride and appreciation. ‘In November 1983, The Big Carrot opened its doors in Toronto offering a one-stop shopping experience with a vegetarian deli, bulk foods, organic produce and a selection of wholesome groceries. Growing from 9 founding partners to a thriving worker-owned business, The Big Carrot is run in the same democratic manner as when we first opening. What’s the Deadline of Submission? The commissioned artwork will be chosen by The Big Carrot through a one-stage Artwork Selection process. Following the review of all eligible submissions, a final artist/team will be selected for the commission in mid- March 2018. An interest to submit by Feb 20, 2018, at which point we will provide guidelines. Timing is tight for such an undertaking; The Grand Opening for The Big Carrot – The Beach Community Market is scheduled for May 2018. Ideally, the art piece is completed and installed before the opening. Eligibility: Canadian residents or Ontario residents, must be 18 or older or if under 18 entrant must have obtained a parent’s or legal guardian’s prior permission. By entering this contest, all entrants agree to have their name, posted on The Big Carrot website and associated social media channels. No address, contact information or other personal information will be shared by The Big Carrot. Work has to be an original piece and not plagiarized. One submission per person or team.